Big at the box office. The super hero is digitized. As DC's magic exploded into the popular culture through record-breaking films like V for Vendetta and Christopher Nolan's The Dark Knight Trilogy, a wave of animation from Justice League to Static Shock introduced classic heroes to new fans. Searching for new ways to make the great legends important in their original medium, DC turned to longer stories and greater tragedies, reimagining its universe in a monumental reshuffling of characters and continuity. From "retcons" like Infinite Crisis and The New 52 to new acquisitions from Jim Lee's WildStorm to Will Eisner's The Spirit, The Modern Age of DC Comics collects the work of a generation of talent leading the company into the digital era. It includes a new exclusive interview with Batman/Superman artist and DC co-publisher Jim Lee! About the series: Taschen's series on DC Comics explores the origins of comics' most enduring legends and the behind-the-scenes stories of the men and women who created them, era by era. 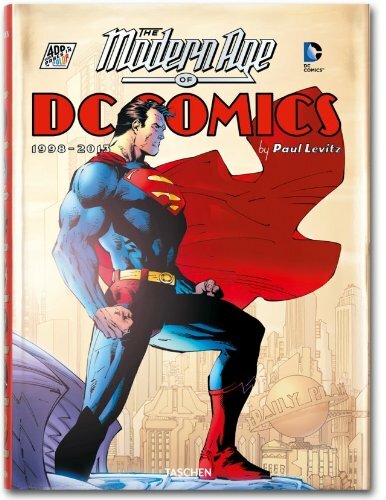 Expanded from the Eisner Award-winning XL book, 75 Years of DC Comics, this new series hits the shelf at a reader-friendly size with essays updated by author Paul Levitz and more than 1,000 new images across five volumes. Thousands of covers and interiors, original illustrations, photographs, film stills, and collectibles have been reproduced to bring the story lines, the characters, and their creators to vibrant life, making this an invaluable reference for comics fans.